What’s In the Proposed Fiscal Year 2019 Budget for Affordable Housing? Local funding for affordable housing will increase modestly under the proposed fiscal year (FY) 2019 budget, adding to the District’s substantial commitment to housing in recent years. Yet most of DC’s housing investments proposed for FY 2019 will not help the city’s lowest-income residents. Total local funding for affordable housing will be $217.4 million, an $8.4 million or 4.0 percent increase from last year after adjusting for inflation (Figure 1). While these resources are significant, the budget does not make much progress in expanding assistance to DC’s extremely low-income families, who face the most severe affordable housing challenges. The budget adds some new rental assistance for formerly homeless residents, but does not provide any new rent vouchers for families on the DC Housing Authority waiting list. The budget does not add any operating subsidies for affordable units developed through the Housing Production Trust Fund. Because Trust Fund units typically require ongoing operating assistance to be made affordable to the lowest-income residents, it is unclear how the District will reverse its poor track record of fulfilling the statutory requirement that 40 percent of Trust Fund resources support housing affordable to extremely low-income residents. The proposed FY 2019 budget provides $100 million for the Housing Production Trust Fund (Figure 2). The Trust Fund, DC’s main affordable housing tool, provides low- and no-interest loans to housing developers to help build or renovate affordable housing. 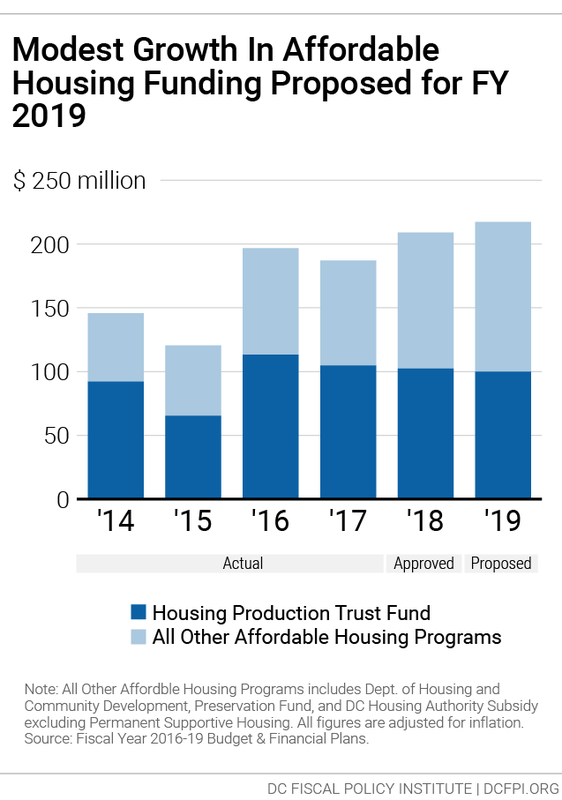 This will be the fourth year in a row that $100 million will be invested in the Housing Production Trust Fund—one of the highest funding levels in the Trust Fund’s history. The proposed FY 2019 budget supports the Trust Fund with $60.7 million in dedicated taxes and a $39.3 million supplement. Each year, 15 percent of deed recordation and transfer tax collections are dedicated to the Trust Fund. 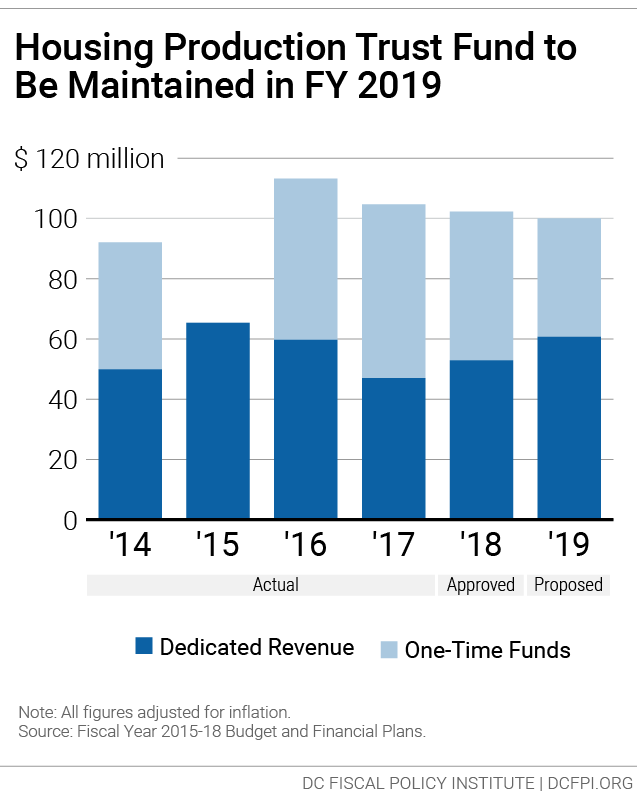 The one-time supplemental funding is not built into future budgets, meaning that additional funding will need to be identified again a year from now to maintain the $100 million funding level. The proposed FY 2019 budget adds $10 million to the District’s newest affordable housing tool: a fund dedicated to preserving existing low-cost housing. This brings the total amount of resources available to the fund to $20 million, including last year’s $10 million investment. 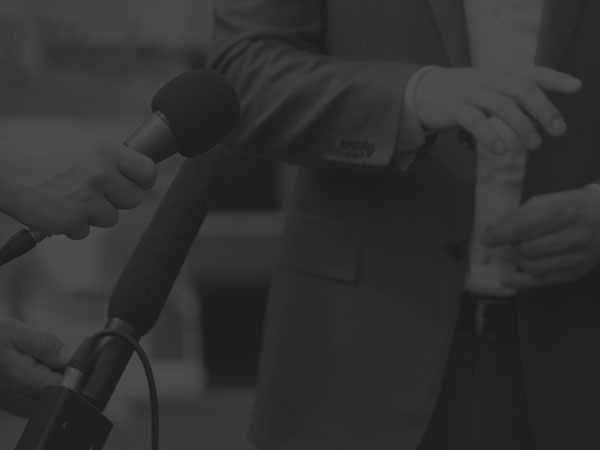 According to the Department of Housing and Community Development, these funds are expected to leverage an additional $60 million in private-sector and philanthropic investment. The affordable housing preservation fund will provide financing to help acquire and rehabilitate affordable housing projects, such as privately-owned buildings with federal subsidies that are about to expire. The fund was a key recommendation of the housing preservation strike force convened by Mayor Bowser in 2015. 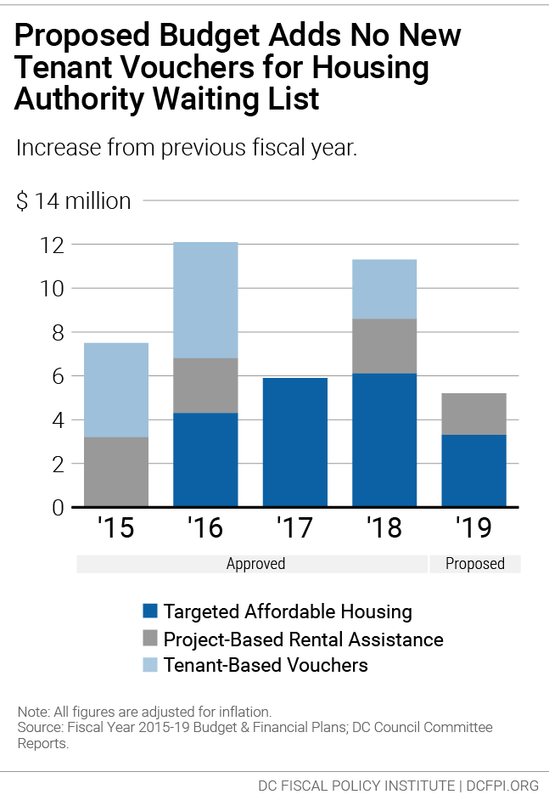 The proposed FY 2019 budget provides some new funds for rental assistance through DC’s locally-funded rental voucher program, the Local Rent Supplement Program (LRSP) (Figure 3). However, the budget fails to substantially expand access to deeply affordable housing. The proposed budget adds $2.3 million to assist formerly homeless residents: 100 families and 70 individuals. This represents an 18 percent increase from last year, adjusted for inflation, bringing total funding for Targeted Affordable Housing (TAH) to $19.1 million. TAH helps residents who had been in Permanent Supportive Housing, and no longer need the included intensive services but still need help affording housing. It also helps residents whose temporary Rapid Rehousing assistance is ending who still need help paying rent. The proposed budget includes no new funds for vouchers to help families on the DC Housing Authority waiting list pay the rent at a private market apartment. The households at the top of the list have been waiting for assistance for a decade or more. Flat funding for tenant-based LRSP at $29.3 million represents a 2.2 percent cut from last year, adjusted for inflation. The proposed budget adds $1.9 million in operating assistance for public housing units redeveloped through the New Communities Initiative. This would bring total project-based LRSP funding to $22.1 million, a 6.8 percent increase adjusted for inflation. However, the budget would not add any new funds for rental assistance linked to affordable buildings developed through the Housing Production Trust Fund. Without new project-based LRSP, it is unclear how the Trust Fund will meet the statutory requirement that 40 percent of its resources support housing affordable to extremely low-income residents. Furthermore, the proposed budget removed $1 million in project-based LRSP funds that were allocated for FY 2019 by the DC Council as part of the FY 2018 Budget Support Act. The funds were intended to be awarded to projects in FY 2018, and the DC Housing Authority has already issued a request for proposals. The RFP will not be able to actually commit subsidies to affordable buildings unless the funds are provided in the FY 2019 budget. Unless the Local Rent Supplement Program (LRSP) is scaled up beyond the level provided in the proposed FY 2019 budget, or the District pursues new strategies to finance affordable housing, the District’s other affordable housing tools will continue to fail to reach extremely low-income residents in a meaningful way. The District’s recent affordable housing efforts, while substantial, are ill-matched to need. Since 2015, when DC began large new investments in affordable housing programs, the District has produced or funded fewer new affordable rental units for extremely low-income households (those below 30 percent of the area median income, or AMI) than for higher-income groups—even though three-fourths of DC families who face severe housing challenges are extremely low-income (Figure 4). The primary roadblock in the District’s ability to meet the housing needs of extremely low-income residents is the lack of adequate operating assistance and vouchers through LRSP —a reality that goes un-remedied in the proposed FY 2019 budget. 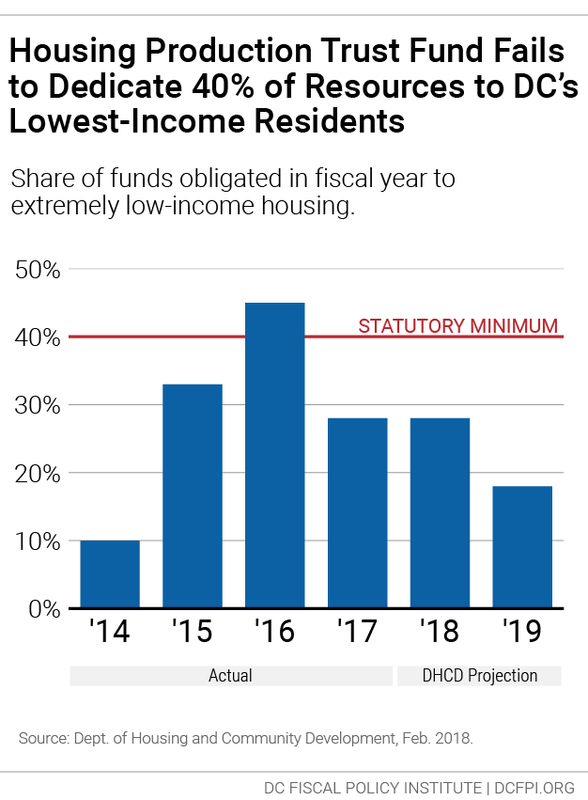 Without additional project-based LRSP, it is unclear how the District will reverse its poor track record of meeting the statutory requirement that 40 percent of Housing Production Trust Fund resources serve extremely low-income residents (Figure 5). In the 5-year period between 2015 and 2019, the District is projected to have met the Trust Fund’s extremely low-income targeting requirement only once. 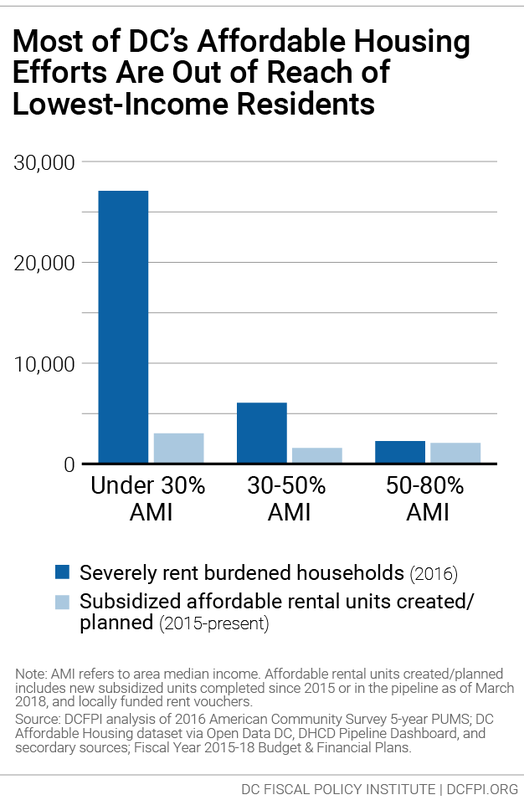 Of recent Trust Fund-assisted units that have been affordable to extremely low-income households, nearly all were created by linking the unit to an ongoing operating subsidy from the Local Rent Supplement Program. Operating subsidies are the best option to help deeply affordable buildings maintain a sustainable cash flow over the long term. Without ongoing assistance, units affordable at extremely low income levels would need substantially more up-front gap financing assistance. The budget significantly expands programs that help low- and moderate-income residents become first-time homebuyers. The Home Purchase Assistance Program (HPAP) provides interest-free loans for down payment and closing costs. The Employer Assisted Housing Program (EAHP) provides down payment assistance to DC government employees. 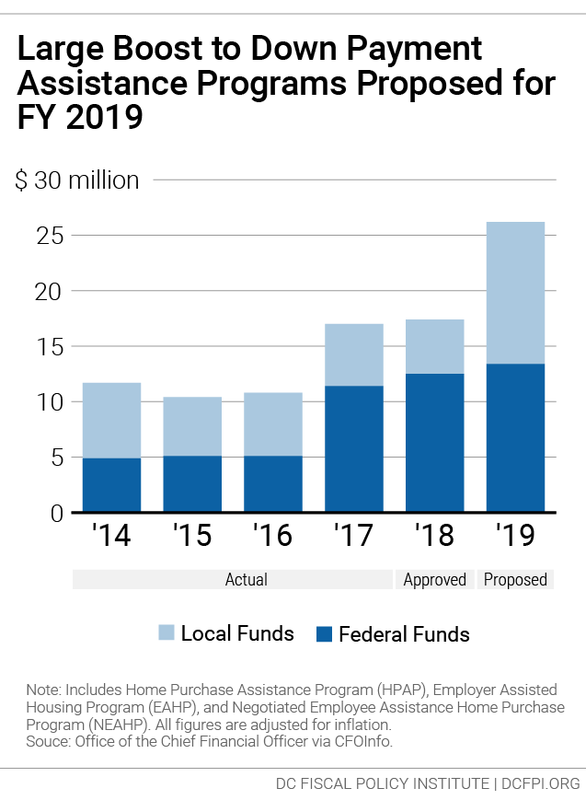 Total funding for home purchase assistance programs—federal and local funds combined—would be $26.2 million under the proposed FY 2019 budget (Figure 6). The budget would add $9.2 million for HPAP and EHAP, a 50 percent increase after adjusting for inflation. Of the $9.2 million increase, $7.9 million comes from local funds, with the remainder from federal funds. Funding for down payment assistance was also increased in FY 2017 and FY 2018, as the maximum amount of assistance available per household was raised to keep up with the District’s high and rising home prices. The proposed increase for FY 2019 is intended to cover both the higher allowable loan amounts and the substantially higher demand for HPAP and EHAP among prospective first-time homebuyers. 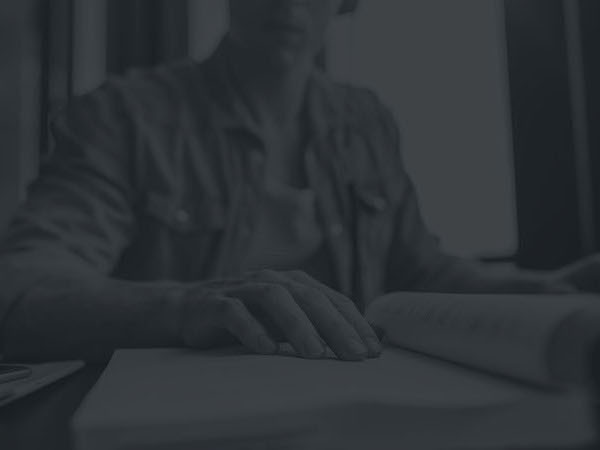 Permanent Supportive Housing places chronically homeless individuals and families into affordable housing with built-in case management services. The proposed FY 2019 budget includes $7.6 million to expand Permanent Supportive Housing to approximately 50 families and 250 individuals as part of an effort to end chronic homelessness. These changes are covered in more detail in DCFPI’s analysis of the proposed FY 2019 budget for homeless services. Permanent Supportive Housing is not included in the total amount of funding for affordable housing, due to data consistency issues that preclude accurate comparisons across fiscal years. A short summary of PSH in the proposed FY 2019 budget is available on page 5, and a full analysis can be found in DCFPI’s analysis of the homeless services budget. The Home First program, a rent subsidy program within the Department of Behavioral Health that helps individuals with mental health disorders bridge into long-term housing, will no longer be included in DCFPI’s analyses of the affordable housing budget, due to data availability issues and because it is a bridge program and not a permanent affordable housing program. B22-0244, Fiscal Year 2018 Budget Support Act of 2017, Title II, Subtitle U, “Local Rent Supplement Project-Based and Sponsor Based Funding.” Effective from Dec. 13, 2017. DCFPI analysis of American Community Survey 5-year Public Use Microdata Sample. Subsidized new rental units by income level is from the Affordable Housing dataset available through Open Data DC, which shows projects completed, under construction, or in the pipeline 2015 through March 2018. 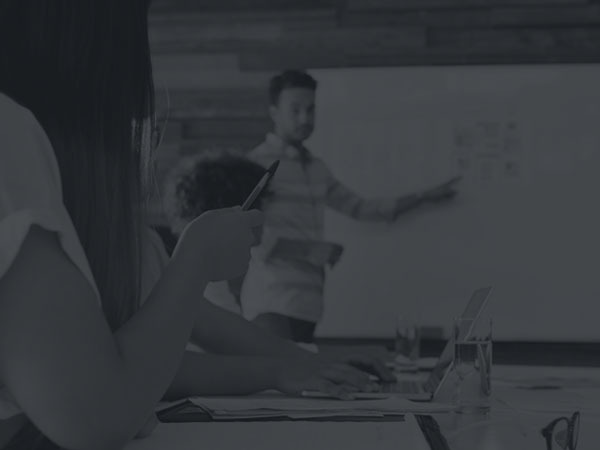 Information on project type and tenure was obtained by matching projects to the Department of Housing and Community Development’s Development Finance Division Pipeline Dashboard, with remaining missing data filled using secondary sources. Projects associated with independent housing agencies (DC Housing Finance Agency or DC Housing Authority) not in partnership with a DC executive agency were not included. Department of Housing and Community Development, FY 2017/2018 Performance Oversight Pre-Hearing Responses submitted to the DC Council Committee on Housing and Neighborhood Revitalization, Feb. 2018.